Infinite temperature control for precise mashing! 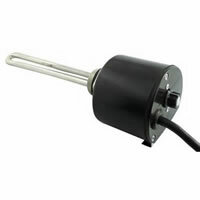 This electric brew heater is used for Sparging and Mashing, NOT FOR BOILING. This Brew Heater is ideal for people without a gas burner and need a way to quickly bring water to a good mash or sparge temperature. Simply plug in the wall and stick in your brew kettle!